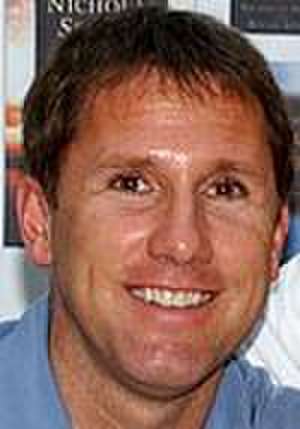 Nicholas Charles Sparks (born December 31, 1965) is an American romance novelist and screenwriter. He has published twenty novels and two non-fiction books. Several of his novels have become international bestsellers, and eleven of his romantic-drama novels have been adapted to film all with multimillion-dollar box office grosses. Sparks was born in Omaha, Nebraska and wrote his first novel, The Passing, in 1985, while a student at the University of Notre Dame. His first published work came in 1990, when he co-wrote with Billy Mills Wokini: A Lakota Journey to Happiness and Self-Understanding, which sold approximately 50,000 copies in its first year. In 1993, Sparks wrote his breakthrough novel The Notebook in his spare time while selling pharmaceuticals in Washington, D.C.. Two years later, his novel was discovered by literary agent Theresa Park who offered to represent him. The novel was published in October 1996 and made the New York Times best-seller list in its first week of release. De (autor) Nicholas Sparks et al. De (autor) Billy Mills et al. Editat de Juliana Dresvina et al.